Barbara Lee Carduff passed away peacefully in her sleep at her home in Sunrise Senior Living in Grand Rapids, MI on Sunday evening, October 14, 2018. She was 93 years old. Barbara was the widow of Jay Jackson Carduff, M.D. (d. 1986), and the beloved mother of four children, seven grandchildren, and three great grandchildren. Barbara was born in the Brookside neighborhood of Kansas City, Missouri at her grandmother “Mimi’s” bungalow on May 23rd, 1925. She and Jay graduated from Central High School in Kansas City in 1942. It’s true that Jay fell in love with her when she was reading the poem “Trees” by Joyce Kilmer aloud during Miss Shrewsbury’s English literature class! After graduation, Barbara worked in the payroll department of Hallmark Cards in Topeka, Kansas while Jay served as a Surgical Technician in the Army Medical Corps during WWII. They were married at Grace Episcopal Cathedral in Topeka on the day the war ended on August 14, 1945. After medical school in Omaha, Nebraska, Barbara and Jay returned to raise their children in suburban Kansas City, Kansas for 30 years until moving to Dallas, Texas to be near three of their four children. At the age of 70, Barbara moved to Grand Rapids to be near her youngest daughter and two grandchildren where she lived independently for nearly 23 years. 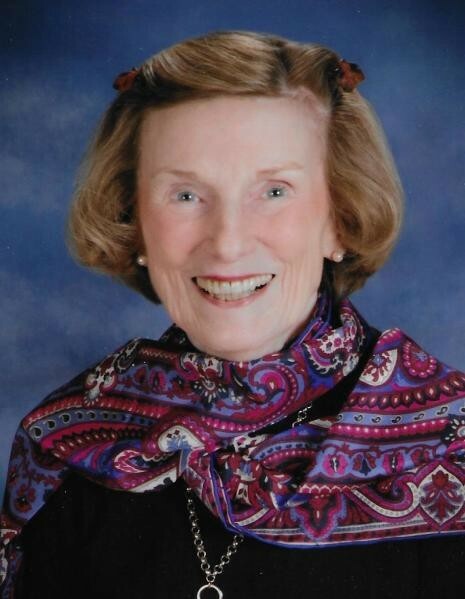 She was a “cradle Episcopalian” and very active at the Episcopal Church of the Transfiguration in Dallas, and St. Mark’s Episcopal church in Grand Rapids. Over the years she served as Lector, Wedding Coordinator, Stephen’s Minister, and member of St. Anne’s Guild, the Altar Guild, and various committees. Her joy in life was expressed in her love of flowers, her study of ballet in her youth, her love of classical music, her travels to New England, her interest in Early American and British antiques, and the beauty and wonder she found in nature including her time spent on Lake Michigan. In her youth, she sang soprano on the local radio, in talent shows, and local venues. She was an avid reader and made numerous quilts and other needlework. In her eighties, she learned Icon painting with her oldest daughter Sibyl. She was energetic and witty, and loved to reminisce about her formative years spent with her brother and grandmother, and precious time spent with “her babies.” She was open-minded and curious, enjoyed a good conversation, was an excellent listener, and was known for her lovely English teas. She expressed a great love for her family, and they loved and cared for her; she was the center of the family and she will be greatly missed. Barbara is survived by her children: Sibyl Dana Reynolds and son-in-law Donald of Pebble Beach, California; Alexander Scott of Dallas, Texas; Christopher Lee and daughter-in-law Elizabeth of New York, New York and Melrose, Massachusetts; and daughter Stacey Meghan Heisler and son-in-law William of Grand Rapids. She was a doting grandmother to her seven grandchildren and three great-grandchildren. She was pre-deceased by her parents, Elmer and Sybil (Tucker) Hiltabidel, and her beloved brother Jim of Chicago, Illinois. Other loved ones include Larry, her close friend and former neighbor; they shared many cups of tea and good conversation together. She will also be missed by her many friends and caregivers at Sunrise, Spectrum Health Hospice, and her companions at Homewatch Caregivers who provided countless hours of love and care over the past several years.